Even when she writes a happy song, Lucinda Williams can’t help but sing it as if she’s lived too long in the throes of sadness. It’s a signet of her sound, intuitively ingrained and imparted in her voice’s weathered drawl. 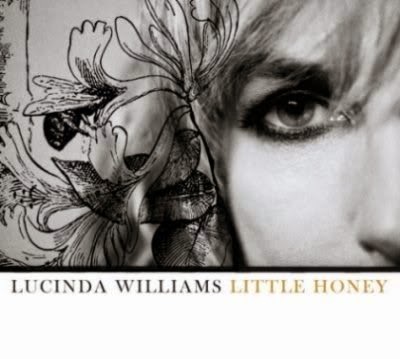 So when she declares, “I’ve found the love I’ve been looking for/ It’s a real love,” in the rambunctious opening track of Little Honey, Williams almost seems more relieved than elated. And while love does inspire most of its songs, the predominant theme of the album is, in a word, endurance. Whether she’s pining with heartbreak or struggling to cope through other trying circumstances, Williams renders a poignant, unvarnished portrait of someone just trying to emotionally survive in this world. She chastises herself for letting her sweetheart go in the mournful sway of “If Wishes Were Horses” as she achingly pleads for him to come back. Accentuated by country and gospel subtleties, “Circles and X’s” finds Williams lamenting in the bittersweet role of the other woman while “Knowing” sees her recognizing a good thing after missing out for too long. With more rewarding prospects in mind, Williams lays claim to her convictions, reconciling her faith in “Heaven Blues” as well as her fidelity in “Plan To Marry,” the latter yielding an epiphany of sorts. After pondering matrimony’s saving grace with disillusionment and suffering all around, she contentedly resolves, “Love is our weapon/ Love is the lesson.” For Williams, such is what makes commitment ultimately worthwhile. And so it’s with an irascibly defiant cover of AC/DC’s “It’s A Long Way To the Top (If You Wanna Rock 'n' Roll)” that Lucinda Williams makes her final stand. When she sings, “I tell you, folks/ It’s harder than it looks,” she’s not just spouting off about the toil and pitfalls of a rock and roll life. She’s underscoring the effort of life itself, which is what she achieves throughout Little Honey with insight and authenticity.